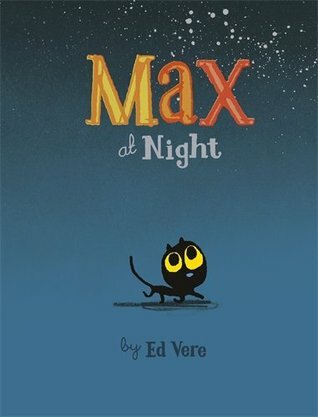 Today I am excited to announce the blog tour for Ed Vere's Max at Night, the first in a two-part blog tour with Sourcebooks! You can find the main page for Max at Night here. Max is tired and all ready for bed, but when he can't find the moon to say goodnight to, he sets out to find it. But that's not as easy as Max had hoped... Witty and heart-warming, this stylish and beautifully illustrated book is the perfect bedtime read. Sometimes in life we all need a break. And even though 'adult' books are often the go-to solution for escaping our daily struggles, sometimes children's books work just as effectively - and they're even better if you have a child (or fellow adult) to share with! Max at Night is about an adorable kitten that can't go to sleep until he has said goodnight ot everything, including the moon. So when the moon doesn't immediately respond to his 'goodnight,' Max sets out on a mission to find the moon. This story is so fun and imaginative and makes a truly perfect bedtime story. The illustrations are flawless, and I loved the simplistic style used throughout. I felt like the style of the drawings really reflected the simplistic yet creative style of the story itself. The colors are vibrant and clear, and I especially enjoy the fact that this book is not overly stimulating for a nighttime read. I would recommend this to anyone I know that has a child, babysits children, or generally works with children, because this is a perfect story that I feel will both keep kids engaged and also send them off to bed with pleasant dreams. I certainly plan to buy a few copies of these as gifts for the children in my life this Christmas! Below is a Rafflecopter giveaway that gives you the opportunity to win an original sketch by author and illustrator Ed Vere! ED VERE is the New York Times and USA Today bestselling author of Max the Brave (Sourcebooks, 2015), which was also named one of The Sunday Times’s 100 Modern Children’s Classics. His book, Mr Big, was chosen by Book Trust as the official Booktime book for 2009 and was distributed to 750,000 British schoolchildren, making it the largest single print run of a picture book. Vere was also the World Book Day illustrator for 2009. In addition to writing and illustrating children’s books, Vere is also a painter and is represented by galleries in London and Los Angeles. He lives in London.